Nekhbet was the Egyptian white vulture goddess and protector of Egypt and the Pharaohs. She was referred to as "Mother of Mothers, who hath existed from the Beginning". She was the patron goddess of the Upper Egypt city of Nekheb (modern day El Kab), from which her name derives. Nekheb was the site of a temple to the goddess and housed the oldest oracle in Egypt. Nekhbet was also the patron of nature and of childbirth, who was depicted as the nurse of the future king during his infancy. Status: Nekhbet had her own cult center at Buto. Wadjet as the cobra goddess of and Nekhbet the vulture goddess were referred to as the "Two Ladies"
Titles: The "Mother of Mothers, who hath existed from the Beginning", "Daughter of the sun", "White One of Nekhen" and one of "Two Ladies"
Nekhbet was the Egyptian protective, white vulture, winged goddess who featured in the stories, myths and legends in Egyptian Mythology. Nekhbet features in versions of the creation myth, the ancient Pyramid texts and in the Book of the Dead. She was strongly connected with funeral imagery and the cult of Osiris and was believed to be present at the birth of Osiris. She was the guardian and protector of the pharaoh and of the non-royal deceased. As a protective winged goddess she was often represented as a vulture extending one wing to the front flying above the person she is protecting, the other wing pointed to the ground as protector of the deceased. Her connection with childbirth continues as she was the patron deity of childbirth. 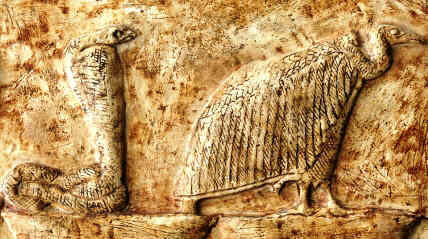 Nekhbet was often depicted perching on top of a circular object or her carrying one in her claws. This object was known as the round Shen ring. Anything inside the ring was eternally protected as it was a symbol of divine power. Another one of her symbols was the Lotus or water lily which symbolized the sun, of creation, rebirth, regeneration & represented Upper Egypt. Her headdress usually depicted the White Atef crown Upper Egypt (south) as shown in the famous following picture of the 'eye'. 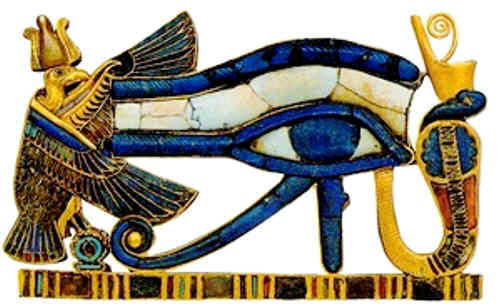 Nekhbet as a goddess of the heavens was associated with both the moon and the sun when she was called 'Eye of Ra'. The Egyptian Vulture was also called the White Scavenger Vulture. The adult's plumage is white, with black flight feathers in the wings. As a symbol of royalty the birds were protected by the law of the kings and gave rise to the nickname "Pharaoh's Chicken". The vulture seems to be a strange choice of bird to symbolize such an important goddess but the ancient Egyptians viewed vultures as being excellent models of motherhood. White vultures also symbolized purity as the ancient Egyptians believed these vultures were all female and able to reproduce without males. The queens of Egypt were often depicted wearing the vulture headdress that symbolized Nekhbet. Nekhbet was originally the white vulture goddess of the white crown of Upper Egypt in the south of the country and Wadjet was the goddess of the red crown of Lower Egypt in the north. Following the unification of Upper and Lower Egypt Nekhbet was paired with Wadjet, the cobra goddess and together they were referred to as the 'Two Ladies'. In Ancient Egyptian texts, the term 'Two Ladies' is a religious euphemism for Wadjet and Nekhbet, who represent the unification of Lower Egypt and Upper Egypt. The role of Wadjet was seen as a forceful defender whilst the role of Nekhebet, was seen as a meeker and motherly defender of Egypt. 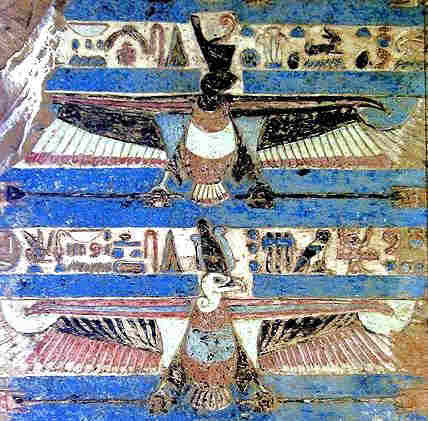 The following picture of the Two Ladies, as protective winged goddesses, adorns the ceiling of a temple in Kom Ombo (Ombus). Nekhebet wears the White Atef crown of Upper Egypt (south) and Wadjet wears the Red Crown (Deshret) of Lower Egypt. 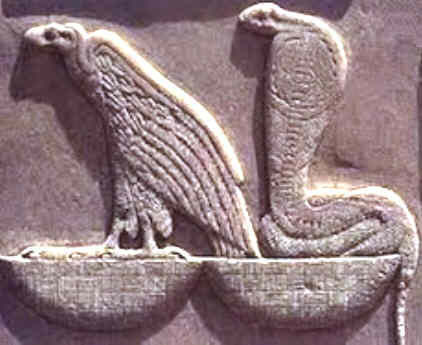 The 'Two Ladies', Nekhbet and Wadjet, were often depicted together as illustrated in the following bas relief's. When Memphis became the new capital of Egypt its priests justified its new status by developing a different version of the creation myth and the Triad of Memphis (Ptah, Sekhmet and Nefertem) came into prominence. 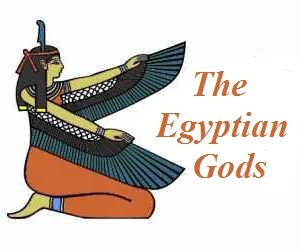 In the period known as the New Kingdom Nekhbet was eventually 'absorbed' by the powerful Mother goddess Mut. Mut is often depicted wearing the Royal Vulture Crown consisting of a feather headdress with its wings spread round her head in the act of protection, adorned by a Uraeus - the symbols of the 'Two Ladies'. Discover interesting information and research facts about Nekhbet, the Egyptian guardian goddess. The facts about Nekhbet provides a list detailing fascinating additional info to increase your knowledge about Nekhbet in Egyptian Mythology. 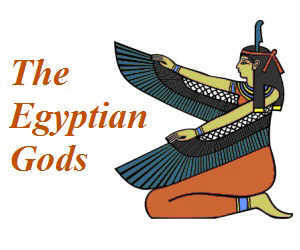 Fact 4: She was also the protector of the pharaohs and of women in childbirth.